I began the morning in Dinosaur National Monument, a park that spans across the Utah/Colorado border. I took a variety of short hikes beginning with a short uphill climb to Cub Creek Petroglyphs where I found some of the largest rock carvings I have seen on my adventures. The carvings included triangles, swirls, and faces in addition to large lizard like animals and a figure that looked like a flute player. The well defined petroglyphs seemed to have weathered the harsh, desert conditions. After admiring the cliff wall, a squirrel perched on a nearby boulder, and countless lizards that scurried across my path, I stopped at the Josie Bassett homestead. Josie Bassett Morris grew up in Brown’s Park with her family who hosted many guests including outlaws like Butch Cassidy. Josie, a pioneer, was also a progressive woman. She married five times, divorced four husbands and widowed one at a time when divorce was unheard of. When lands near Vernal opened up for homesteading around 1913, forty year old Josie found land she wanted at Cub Creek. She built a cabin, raised livestock, poached deer, bootlegged whisky and planted crops on her land where she lived for the next fifty years without plumbing, electricity or a telephone. In order to run herremote ranch more efficiently, she switched from wearing skirts to wearing pants and cut her hair short to keep from getting tangled in brush. After falling and breaking her hip at the age of 89, she was moved from her cabin and died a few months later. From the cabin, I took a short trail past a small, mosquito infested pond and through a valley of tall grasses and wildflowers to a box canyon where Josie penned her animals. On my way, a bunny stood perfectly still in my path until I was only a few feet away from it! Before I left Dinosaur National Monument, I took the shuttle to the Fossil Discovery Trailhead where I visited three areas of fossils within ¾ of a mile of each other; Mowry Shale, Morrison Formation, Stump Formation. Once an inland sea, the Mowry Shale was deposited 100 million years ago. It is thought that volcanic ash in the water killed the fish and strong currents tore the bodies apart leaving fossilized fish scales. The Morrison Formation, approximately 150 million years old, is peppered with dinosaur fossils. Vertebrae, femurs, and other fragments of bones from ten different species of dinosaurs can be found in this formation. In addition, clam fossils and impressions of tortoise shells can also be found in the rock, once a creek bed and now uplifted and eroded into tilted layers. The Stump Formation is estimated to be 163 million years old and shows evidence that it was once part of an ocean as it displays fossils of clams, snails, ammonites, and belemnites. formations, the roads climbs the hillsides through pines and aspens and into open meadows. As I was singing to Lyle Lovett’s “Give Back My Heart”, about 75 yards ahead on the right hand side of the road, a mountain lion trotted down a small mound and across the road. Stunned, I braked as smoothly as possible and reached for my camera as I came to stop in the middle of the two lane highway where I had hardly seen any traffic despite it seeming like a main road. By the time I had raised my camera to my face, the cat had disappeared into the brush on the opposite side of the road. Just after the small mound, I turned onto a dirt road cut through the meadow. Oh how I hoped it would reappear! It was right in front of my eyes, yet I couldn’t spot it, and logic prevailed…I DID NOT get out of VANilla to look for it. I’m sick I missed the shot, but it was truly amazing to watch it saunter past me in broad daylight. It gave the illusion like it was moving slowly, yet it was hidden by the time I did a double take, reached for my camera, and traveled fifty yards. SO COOL…and such a highlight of my day! The rest of the day could have been a complete disaster, and I would have still claimed it was AWESOME! Shortly thereafter, we reached Red Canyon, where a marmot scampered across the road. A car was behind me, so I kept going to the Visitor Center and canyon rim. Petey joined me for a walk along the rim which offered amazing views of the vast reservoir, surrounding red cliffs and snow capped mountain in the distance. Not five minutes after we began our stroll, thunderstorms rolled in. We quickly found two caches, both a physical one and a virtual one before returning to VANilla. As soon as we took cover and turned to exit the area, the rain seemed to stop. As luck would have it, the marmot was next to the tree to which it had dashed thirty minutes prior, so I snapped a photo, before continuing on to see a deer leap over a five foot fence. It was just a day of wildlife! from pursuing posses…oh well, perhaps another time. Once again, as soon as I turned around, the down pour turned to sprinkles and the road dried up as fast as it had turned into a drainage ditch. I took advantage of the next burst of dry weather and followed the Sheep Creek Canyon Geological Loop to the Ute Mountain Fire Tower, one of the first fire towers constructed in Utah. The fire tower, situated at 8,834 feet in Ashley National Forest was built in 1937 by the Civilian Conservation Corps. It is the only fire tower in Utah that doubled as a fire detection tower and living quarters. 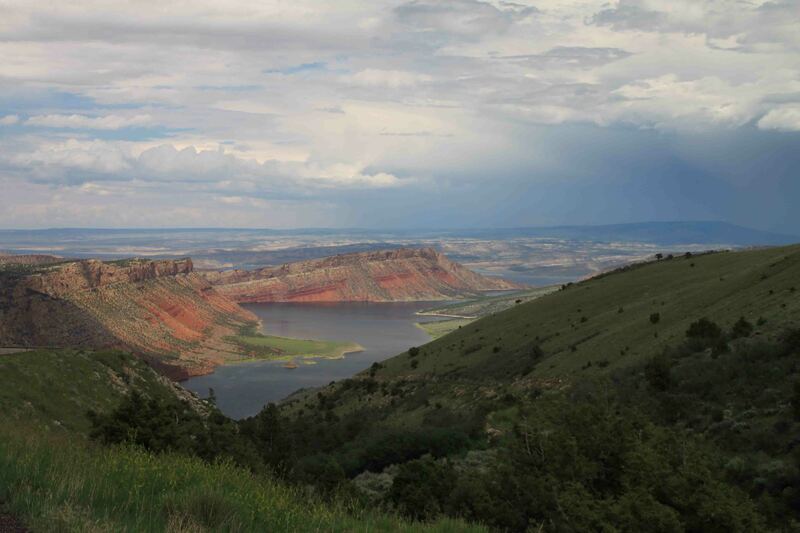 While I would have liked to continue my drive along the loop through the breathtaking forest of aspen, pines, and wildflowers, the road was closed, so I had to return to Hwy 44 which offered superb views of Flaming Gorge: rolling green hills, flaming red cliffs, and deep blue waters. one lay in the grass fifteen feet away from the herd. I don’t think I have ever seen that many in one spot nor have I seen them lying down. Generally they are maneuvering over steep terrain. I finally reached Green River late in the afternoon, turned west toward Bear Lake as I passed by countless prairie dogs and descended down through Logan Canyon. I almost stopped at Bear Lake as I will be returning to the area tomorrow, but I am so glad I didn’t as I would have missed this fantastic scenic drive along Logan River, beneath limestone cliffs and rolling green hills that looked like Ireland with pines, junipers, sagebrush, maples, and firs. I complete the same drive in reverse direction tomorrow and plan on stopping at dozens of pullouts to capture some breathtaking views on film (or I guess on an SD card)…ETB. Wow… beautiful pictures of the Red Canyon and the Flaming Gorge! It’s so much fun to see wildlife. Bud and I went to the Rocky Mountain National Park several years ago. We would love to go back. Especially now, when it’s 100+ degrees here in Texas. Safe travels! What a day Beth!!! Really fascinating and I LOVED the Big Horn Sheep. And the Mountain Lion… what a thrill! !